PASADENA — A former girls’ softball coach at Pasadena High School has been cited on suspicion of child annoyance after accusations emerged that he had engaged in inappropriate conversations with one of his players, authorities said Thursday. Police issued Arthur Baltazar, 47, of Altadena a misdemeanor citation Sept. 23 on suspicion of engaging in “inappropriate communication of a sexual nature,” with a 17-year-old girl he coached, Pasadena police Lt. Tracey Ibarra said. The alleged inappropriate communication took place both verbally and via text messages during September, the lieutenant said. “There’s no allegation of any kind of physical touching,” she said. The softball player told her parents she was receiving inappropriate communications from Baltazar on Sept. 23, Ibarra said. The parents notified the school, which then called the police. Baltazar was cited the same day and released from custody later in the afternoon after posting $500 bail, according to sheriff’s booking records. Baltazar was employed as a “walk-on” softball coach at the school during the 2010 season, from March 11 to June 20, Pasadena Unified School District spokeswoman Binti Harvey said. He is not a teacher. His employment ended along with the softball season, and he would not have been re-hired next year because he failed a background check, Harvey said. She declined to further comment. “It’s a police matter,” she said. Baltazar could not be reached for comment Thursday. According to Los Angeles County Superior Court records, Baltazar was convicted of driving with a suspended license in Glendale Superior Court in July of 2000, and unlawful display of evidence of vehicle registration in Alhambra Superior Court in January 2000. The alleged misconduct took place after the softball season. The new case against Baltazar is in the early stages of investigation and had not yet been presented Thursday to the City Attorney’s Office, which will review the results of the police investigation and determine whether criminal charges are warranted, Ibarra said. PICO RIVERA — A motorcyclist died at the scene of a crash Wednesday, authorities said. The crash was reported just before 1 p.m. on Serapis Avenue near Bermudez Street, Los Angeles County sheriff’s Sgt. Eric Barron said. The motorcyclist, initially described as a 26-year-old man, was pronounced dead at the scene, Los Angeles County Fire Department Capt. Rick Alleman said. The motorcycle struck two parked cars, Barron said. PASADENA — Officials jailed a local man Sunday after police said he intentionally struck a woman with his SUV on Colorado Boulevard. Neil Colleran, 38, was booked on suspicion of attempted murder, Pasadena police Lt. Diego Torres said. The alleged attack took place about 1:45 p.m. in the 3000 block of East Colorado Boulevard, between San Gabriel Boulevard and Sierra Madre Villa Avenue, Lt. Chris Russ said. “The incident stemmed from an argument that occurred (Saturday) in the same general area,” Russ said. Further details about the previous argument were not available. After striking the woman, estimated to be in her 30s, with his BMW SUV, Russ said Colleran allegedly continued driving east on Colorado Boulevard. Police learned a possible license plate number for the SUV and arrested Colleran at his home in Pasadena later Sunday, police said. The SUV was found parked in the parking lot of a nearby church, Russ said. The woman was hospitalized with a cut to her head that police described as moderate. Sunday’s arrest was the second time in two days Colleran has found himself behind bars in the Pasadena Police Department’s jail. He was arrested by Pasadena officers Saturday evening due to an outstanding misdemeanor warrant, but was released about an hour and a half later, according to police and sheriff’s booking records. It was not clear Sunday what the warrant had been issued for. According to sheriff’s booking records, Colleran was being held in lieu of $1 million bail. Information regarding his initial court appearance was not available Sunday. Rigoberto Ruelas, 39, a teacher at Miramonte Elementary School, was last seen last Sunday dropping off a present for his sister’s birthday, according to the South Gate Police Department. Ruelas’ body was found just before 9 a.m. in the forest, said Deputy Jeff Gordon of the Sheriff’s Headquarters Bureau. The Times’ analysis of teacher performance took into account available student scores on standardized tests between 2002 and 2009. “The value-added scores reflect a teacher’s effectiveness at raising standardized test scores and, as such, capture only one aspect of a teacher’s work,” reads a disclaimer on the online database of teachers. “Although value-added measures do not capture everything that goes into making a good teacher or school, The Times decided to make the ratings available because they bear on the performance of public employees who provide an important service, and in the belief that parents and the public have a right to the information,” according to the website. AZUSA — Police shot a wanted parolee with a Taser and arrested her Friday after she threatened to kill herself with a knife, authorities said. Desiree Portillo, 35, of Azusa was booked on suspicion of violating parole stemming from a previous firearms-related crime, Azusa police Sgt. Mike Gurbada said in a written statement. Police went to a house in the 700 block of South Vincent Avenue about 11 a.m. in search of the parolee-at-large, the sergeant said. When police confronted Portillo at her home, they found her “armed with a knife, which she held against her throat, threatening to kill herself,” Gurbada said. After Portillo refused several orders to drop the knife, he said, police shocked her with a Taser, which immediately incapacitated her. Portillo dropped the knife and was taken into custody. The woman was treated at the scene for minor injuries, arrested for her outstanding warrant and turned her over to parole officials, Gurbada said. According to sheriff’s booking records, Portillo was being held without bail and was due for arraignment Monday in West Covina Superior Court. ALHAMBRA — A bank heist in Alhambra Thursday is believed to be the latest crime of a serial robber the FBI calls, the “Golden Years Bandit,” authorities said Friday. The robbery was reported about 12:20 p.m. at a Chase branch, 808 Main Street, police and FBI officials said. It was at least the third robbery believed linked to the bandit, described by witnesses as being in his 50s, FBI spokeswoman Laura Eimiller said in a written statement. In Thursday’s robbery, “He went to first available teller and passed a note with his demands,” Alhambra police Lt. Dan Rodriguez said. After receiving an undisclosed amount of cash, the robber left. A grey SUV was seen leaving the area around the time of the crime, Rodriguez said, though it was not clear Friday whether the SUV was involved in the robbery. “In the robberies, the Golden Years bandit passed a type-written note which demands large bills and threatened that if the victim teller did not comply with his demands, they would be hurt,” Eimiller said. “The note also suggested that the bandit was working with partner located outside the bank, who would shoot anyone who tried to follow him out of the bank,” she added. A second robber has not been seen during the crimes, officials said. The “Golden Years Bandit” is believed to have robbed a Bank of America branch in Rosemead on March 17, and a Bank of America branch in Alhambra on Jan. 23, Eimiller said. Bank surveillance photos taken from robberies show a similar-looking suspect robbing an East West Bank in San Gabriel on June 26 and a Citizens Business Bank in La Caada Flintridge on June 11, however it was not clear late Friday if those heists were also officially linked to the serial bandit. The “Golden Years Bandit” is described as a white man, about 5 feet 11 inches tall, of large build, with grey hair and a mustache, according to the FBI. Anyone with information is asked to contact the FBI at 310-477-6565 or local police. Sheriff’s deputies Friday found a car belonging to a man suspected of stabbing and wounding his estranged wife as their young children looked on, but the suspect himself remains at large, authorities said. Cesar Meza, 33, is accused of breaking into the home of his 31-year-old estranged wife on Thursday and stabbing her at least seven times in the torso and neck in front of their children, 11 and 9, sheriff’s officials said. Investigators began a manhunt for Meza after the stabbing, and found his Lexus sedan being driven by another man Friday afternoon, Los Angeles County sheriff’s Lt. John McBride said. There was no sign of Meza. “We have a few leads that we’re still working on,” McBride said. Deputies spotted Meza’s Lexus shortly after noon driving in Industry, officials said. Deputies followed the car into El Monte before stopping it at Garvey Avenue and Peck Road, sheriff’s Lt. Victor Sotelo said. The man driving the vehicle was not the suspect and was not arrested, investigators said. “We don’t think he had any knowledge of the suspect,” McBride said. It was possible the man was tricked into moving the vehicle without knowing it was connected to a crime. Meza, who had been estranged from his wife for about eight months, broke into the home at 3:05 a.m. Thursday, waited for her and stabbed her seven times, sheriff’s Sgt. Gerard Valona said. The woman’s children witnessed the stabbing and called the sheriff’s Industry Station to report their father was beating their mother, authorities said. The children’s call likely saved their mother’s life, Valona said. By the time deputies arrived, the man had fled, officials said. The woman was taken to Los Angeles County-USC Medical Center and underwent several surgeries, officials said. She remained hospitalized in “critical-but-stable” condition Friday. “It looks like she’s going to pull through,” McBride said. The sheriff’s Industry Station continued pouring resources into the investigation going into the weekend. “I have every detective in the field working this case,” Valona said. Anyone who sees Meza should not approach him and immediately call 9-1-1 or the sheriff’s Industry Station at 626-330-3322. WEST VALINDA – Two children called 9-1-1 for help while their father stabbed their mother seven times Thursday morning, authorities said. Cesar Meza, 33, of West Covina is suspected in the attack and remained at large late Thursday, said Los Angeles County sheriff’s Lt. John McBride. “He’s on the lam,” he said. Meza is believed to be driving a 1999 black four-door 1999 Lexus with chrome rims and a California license plate number 6LOW853, McBride said. The 31-year-old woman was stabbed repeatedly in her upper torso and neck at a house in the 1400 block of Rama Drive, investigators said. The husband, who was estranged from his wife, broke into the home at 3:05 a.m. and stabbed her with a pocket knife, sheriff’s Sgt. Gerard Valona said. The woman’s children, 11 and 9, witnessed the stabbing and called the sheriff’s Industry Station during the incident. The woman was suffering from multiple stab wounds and was in critical condition, authorities said. She was taken to Los Angeles County-USC Medical Center and immediately underwent surgery. She later underwent a second surgery and was in stable condition, Valona said. “I have every detective in the field working this case,” he said. The couple had been separated for eight months before the stabbing, Valona said. 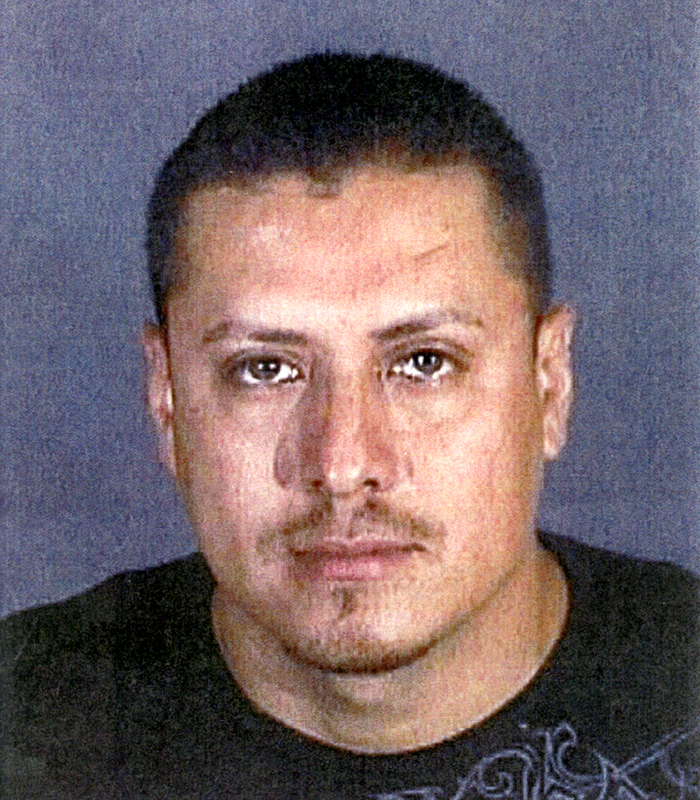 Anyone who sees Meza should not approach him and call 9-1-1 or the sheriff’s Industry Station. Staff Writer Brian Day contributed to this story. GLENDORA — A Glendora man was expected to recover Thursday after police said he was stabbed in the back while trying to stop his roommate from attacking his girlfriend. Jose Bojorquez, 20, of Glendora was booked on suspicion of attempted murder, Glendora police Sgt. Matt Egan said. Officers responded to a report of a stabbing about 6:30 p.m. at a house in the 1100 block of E. Juanita Avenue, the sergeant said. “(Bojorquez) actually physically battered the female,” Sgt. Scott Strong said. The woman was identified as Bojorquez’s 19-year-old girlfriend. “(The 22-year-old victim) intervened in that and then got stabbed,” Strong said. The wounded man was flown to Los Angeles County-USC Medical Center for treatment, Egan said. The wounded man was listed in stable condition Thursday with a cut to his back, Strong said. “He’s going to be fine,” the he said. Bojorquez was found in the garage of the home, where he was living, and arrested without further incident, Egan said. Bojorquez was being held in lieu of $1 million bail and was due for arraignment Friday in West Covina Superior Court, officials said.